Spring is finally upon us! 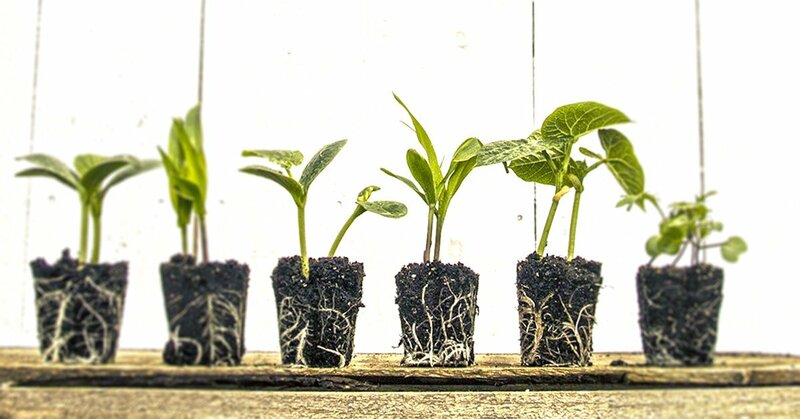 If you haven’t already, it’s time to get your seedlings started indoors. As some of you are aware from my last experiment growing an indoor vegetable garden throughout the winter (part I and part II), the biggest limitation was the light. So, this spring, even though there is more available light than in winter, I’d rather not take my chances. I want SUPERSTAR seedlings…so show me the light! Now I’m not a super technical gardener, but I do know that plants need sunlight to grow. Thankfully, my husband is an electrician, so when I asked him to help me set up a small seedling grow station, he was more than willing to school me in some lighting tips. The color spectrum is important when picking out which light to use. Blue and red light on the spectrum are ideal for plant growth. Blue light (on the cool end of the spectrum) encourages vegetative growth while red light (on the warm end) induces flowering. Seedlings want more blue light since they are growing thick stems and leaves. You’ll need to keep the color spectrum in mind while picking out which type of bulb to use. My husband could have droned on for days about the different types of bulbs, but as he started to see my eyes roll back into my head, he narrowed it down to the one most commonly used for growing seedlings: Florescent bulbs. Brightness: Measured in lumens. The higher the lumens, the brighter the light. 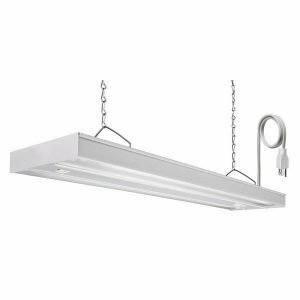 A light that gives off around 450 lumens is about the same as a 40-watt bulb. A light that gives off around 1600 lumens is about the same as a 100-watt bulb. You’ll want higher lumens if you need the light to reach farther. 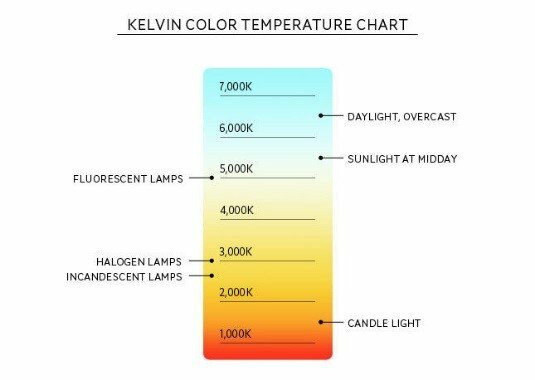 Light Appearance (think color spectrum): Measured in Kelvin units. 5,000-6,500 kelvin units are best for vegetative growth and give off a cooler (blue) appearance. 2,700-3,000 Kelvin units are best for flowering and budding and give off a warmer (orange/red) appearance. 4,000-5,000 Kelvin units are good for general purpose growing; used if you don’t want to worry about changing bulbs. Average lifetime: Normally based on usage of 3 hours per day. It’s best to shop around and see which lifetime is best for the use you need. Less than 300 lumens. This is ok for us since we are only growing a couple flats of seedlings. 6,500 Kelvin units–perfect for vegetative growth in seedlings. Note: If we want to grow the plants to their fruiting stage, we’ll need to update our lighting. When do my seedlings need to go under the light? Most seeds germinate in darker conditions, but there are a few species that need light. If you’re mainly growing basic veggies, just turn on the lights when you see the seeds start to sprout! How long should the lights be turned on? Once the seeds start to sprout, keep the lights on for 12-16 hours every day. Don’t leave the lights on 24 hours a day as, just like you and me, seedlings need a bit of a rest period. Setting the timer on your phone should be sufficient, or if you really want to be fancy, you can purchase an automatic timer. How far should the lights be from the seedling? Basic rule of thumb is to leave 2-3 inches between the light and the tip of the seedling. Growth can happen very rapidly so make sure to monitor and adjust light height as seedlings grow.